Colors in gold, other than yellow, result from the combination of metal alloys mixed with the yellow gold to create various hues. 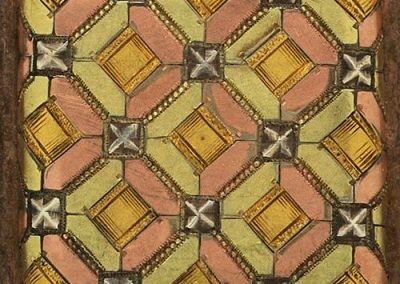 Depending on the alloy(s) used it is possible to create white, rose, green, blue, grey and other shades of gold. 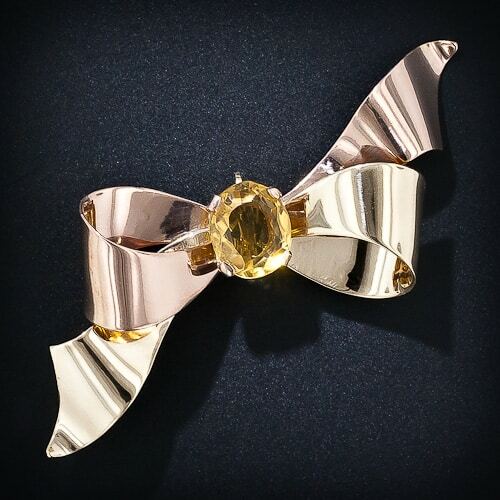 Yellow gold is the most popular alloy of gold. 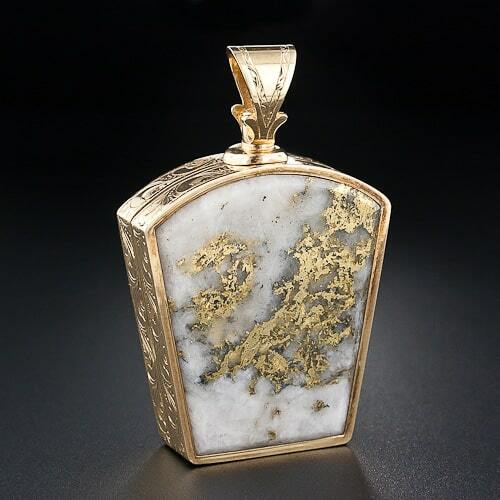 Pure gold is very soft and very difficult to work into jewelry. Alloys can be added to yellow gold to enhance the yellow hue and create a harder, more workable alloy. Typical yellow gold alloys are a mixture of gold, silver, copper and sometimes zinc. 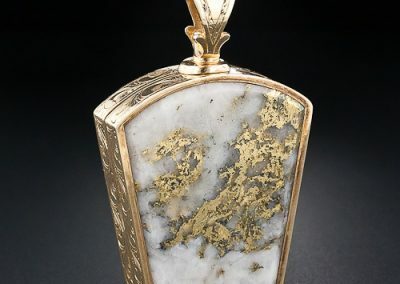 Native Gold in a Quartz Matrix set as a Masonic Fob. 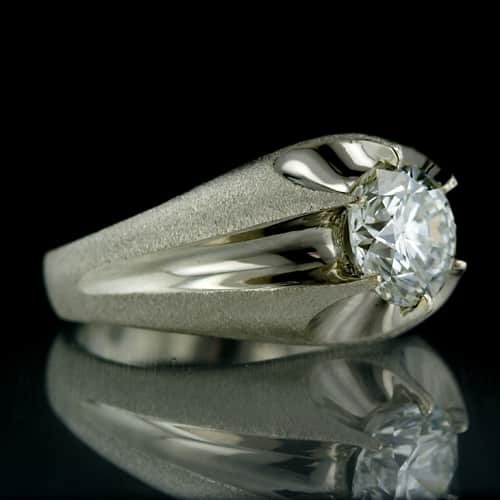 White gold was invented in the 19th century when it was alloyed with palladium. It became commercially available as of 1912 in Pforzheim, Germany and gained popularity in the mid-1920’s as a low-cost substitute for platinum. It is an alloy of gold with copper, zinc and nickel. In more recent times the nickel in this alloy has often been replaced by a member of the platinum family due to allergic reactions. The different recipes produce different alloys which naturally have different characteristics in terms of ductility, malleability, and hardness. These differing properties make different alloys suitable for different purposes. 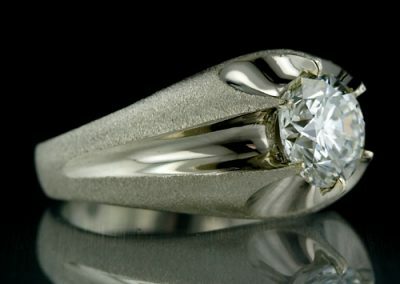 White Gold and Diamond Belcher Ring. Rose gold is a gold alloy with a reddish color. This color comes from high amounts of copper in the alloy. 18K Rose gold usually contains 25% copper and 75% gold (note, these are weight percentages, not volume percentages!). 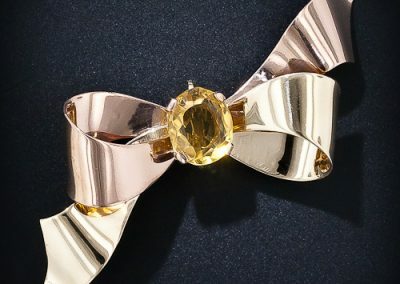 Rose and Yellow Gold Bow Brooch. Green gold is an alloy with silver that is usually 75 percent gold and 25 percent fine silver. Green gold can be made with less silver but it usually includes zinc and copper along with the silver. 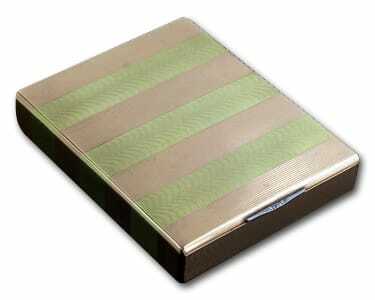 Rose and Green Gold Cigarette Box. Grey gold is an alloy of gold and iron or gold, silver and iron that is a pale grey color. Gold à quatre couleurs refers to the combination of four distinct shades of gold alloy used in a single jewelry item. 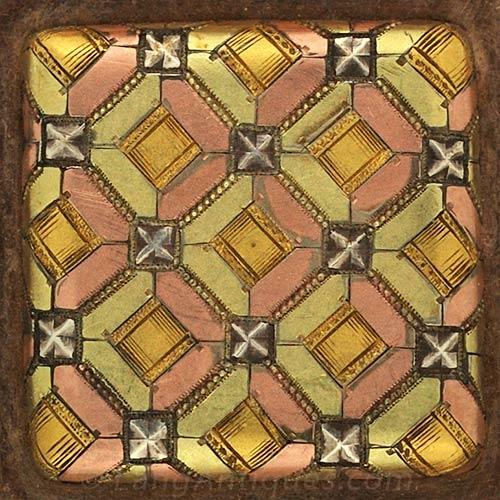 The colors are inlaid and soldered together to create a harmonious design. The combination of green, red, white and blue gold was the mixture most commonly utilized for jewelry design. Although the process was discovered earlier, the technique didn’t really gain in popularity until c.1750. 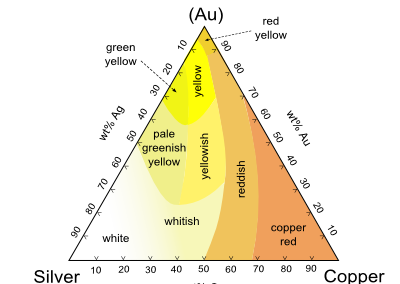 The triangle below shows the relation between the color of gold alloys and their constituents. 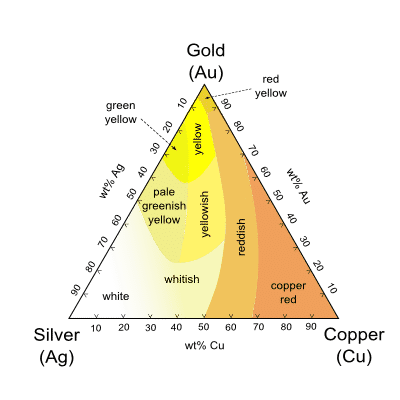 The colors of silver, copper and gold alloys in relation to their composition.